Since the owners Kish and Rita got married in St.Augustine 18 years ago,they fell in love with the historic town. Every year they visited St. Augustine which became their favorite vacation spot and recently acquired the Merida Inn & Suites in 2005. At the Merida Inn & Suites, Kish and Rita always strive to give the best quality service to their guests to make the stay as comfortable as possible. All rooms are furnished for a comfortable stay which includes a user-friendly clean environment. Refrigerator microwave, coffeemaker, dinette, cable with HBO - from Jacuzzi suite rooms to honeymoon suites with garden style tubs - to spacious king and queen-sized bed options - to kitchenettes and a sparkling pool. 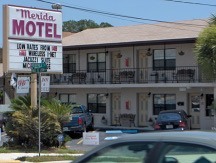 Let the Merida Inn & Suites take care of all your needs to make your stay relaxing and carefree!